The outdoor spaces on your property are subjected to a significant amount of wear and tear; this may take place because of foot and vehicular traffic, exposure to the UV rays of the sun, climatic changes, pollution, dirt and debris etc. The one way to counter most of these effects is to use weather-resistant, hardy and long lasting materials when you are getting your landscaping installed in your property in Creston, Wadsworth, Strongsville, Medina, Norton or Wooster. That is exactly what we at Stoney Creek Landscaping focus on, when we are handling any landscaping job for our clients in and around Barberton, Seville, Orville, Brunswick, Cuyahoga Falls and Green. We have a very simple objective- to provide our customers value for money and very high levels of customer service. Versatility- Interlocking pavers are ideal for driveways, pathways, walkways, porches, patios, decking and entranceways. The versatility of this material is one of the reasons why it’s so popular as well. Aesthetics- Every property owner wants the outdoor spaces around their home or commercial establishment, to look attractive and that is what paver stones do. They enhance the beauty of any space and complement the look of various landscaping themes. Low maintenance- This is a very important aspect; most people lead very busy lives today; and even when they are getting their garden or yard installed, they look for low-maintenance features. Natural stone, concrete and brick pavers are all very low maintenance; and they are an excellent flooring option for commercial and residential outdoor spaces. All they need is an occasional pressure wash and you may have to sand and seal them once every 2 years. Variety- While you can choose between concrete, brick and natural stone pavers, you will find there is a wide range of textures, colors and designs in all these categories. It gives you the flexibility to create the look you want on your property. Long-lasting- Pavers are very hardy and as long as you opt for high grade paving stones, you won’t have to worry about replacing them for a number of years. In fact, with the right amount of care and maintenance, they can last for decades. Cost-effective- Concrete paving stones are the least expensive and ones made of brick come next in line. Natural stone pavers tend to be the most expensive. However, no matter which material you opt for, since they are sturdy and durable, they provide you value in the long term. 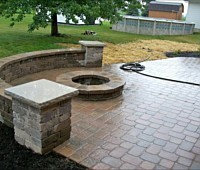 For high grade installations at very low brick paver cost, call Stoney Creek Landscaping at 330-466-3181. If you prefer to contact us via email, please send us your queries via this online form. You can also request an estimate via our home page and we will respond shortly.